Right now you can order with free shipping or a special buy 2, get 1 free deal. Just order as a new preferred customer, enter 2 items and corporate will send you an additional product. Sale goes on through June 8th, 2017. I ordered a set for my hubby and for me. 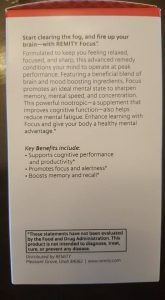 I just finished day 2 and by the second day I was already noticing my brain seemed clearer. Those who suffer with fibromyalgia may understand the fibro fog I would normally feel. I ordered two sets. (Each includes both focus and rest & restore) One for hubby and one for me. Hiding these as our adult kids want them too! Time to order more while they are on sale! Hurry and order yours HERE! 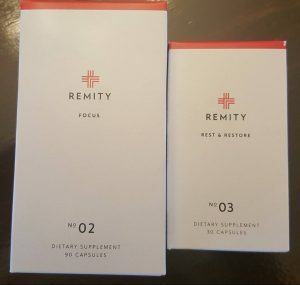 START CLEARING THE FOG, AND FIRE UP YOUR BRAIN—WITH REMITY FOCUS™.